The essays brought together in Islam, Law and Identity are the product of a series of interdisciplinary workshops that brought together scholars from a plethora of countries. Funded by the British Academy the workshops convened over a period of two years in London, Cairo and Izmir. The workshops and the ensuing papers focus on recent debates about the nature of sacred and secular law and most engage case studies from specific countries including Egypt, Israel, Kazakhstan, Mauritania, Pakistan and the UK. Islam, Law and Identity also addresses broader and over-arching concerns about relationships between religion, human rights, law and modernity. Drawing on a variety of theoretical and empirical approaches, the collection presents law as central to the complex ways in which different Muslim communities and institutions create and re-create their identities around inherently ambiguous symbols of faith. From their different perspectives, the essays argue that there is no essential conflict between secular law and Shari`a but various different articulations of the sacred and the secular. 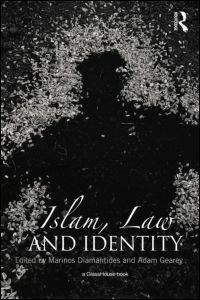 Islam, Law and Identity explores a more nuanced and sophisticated understanding of the tensions that animate such terms as Shari`a law, modernity and secularization.